The Jewish people recite at their Passover Seder each year: ” ולנו לאבותינו שעמדה ויהי “-“This is what has stood to our fathers and to us”, for not just one alone has risen against us to destroy us. “In every generation there are those who attempt to destroy us”, admits Rabbi Fendel, the Chief Rabbi of Sderot’s Yeshiva, currently nurturing over 400 students in study, “however, we stand strong”. Jewish and Zionist philosophy is steeped in resilience- the willpower to go on no matter what obstacles the nation may encounter. Sderot, the small Israeli city located a mere kilometre from Gaza, is no different. As demonstrated in the Sderot Media Center’s latest film, ‘Standing Resilient in Israel’, though bombarded daily by terrorist rockets, Sderot remains a developing city in the Western Negev of Israel. Resilience means survival in Sderot. Resilience of the body, mind and soul. 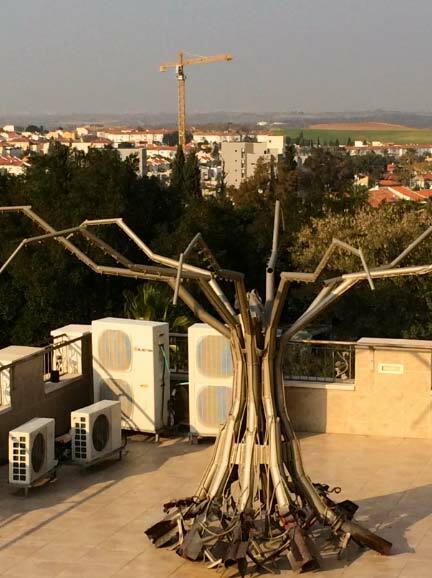 Qassam Tree located on the roof of the Sderot Hesder Yeshiva and a crane in the distance. 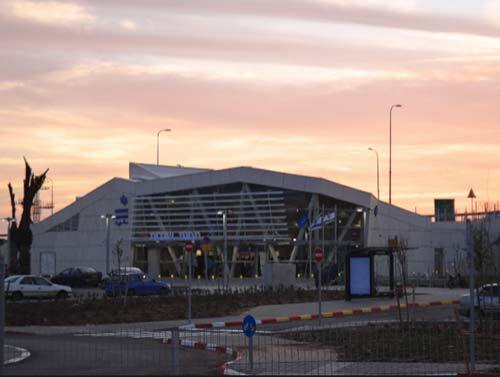 On December 24th, 2013 the first protected railway station was established in the city of Sderot, connecting it to all major centres of activity in Israel and providing unlimited opportunity for its residents. Open less than a month and it is, “already making a big difference” claims Rabbi Fendel, “uniting the country and providing an array of new job opportunities”, a much-needed boost in Sderot as jobs are few and far between. The train station is one-of-a-kind, built to withstand the deadly stream of terrorist rockets that have threatened the very existence of Sderot and the State of Israel for fourteen years to date. Throughout, Sderot has proven that it will stand strong and continue to survive. 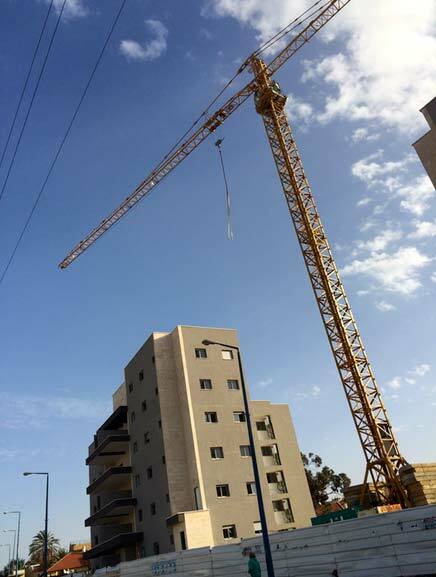 Construction fills the streets of Sderot- Apartment buildings heightening every few blocks, houses blueprinted and schools being covered in a thick layer of cement to protect the children inside. “The Palestinians Arabs wanted to destroy Sderot but they cannot keep up with the building”, acknowledges Rabbi Fendel. Through building anew what has been destroyed and preventing further damage, Sderot will succeed in creating an indestructible metropolis. As architecture is rising rapidly, so are population figures. While the city’s population once numbered 24,000 and lost approximately 5,000 residents due to heavy rocket fire and its palpable disruptions to daily life, the city is now bordering on 20,000. People are constantly joining the story; singles, couples and families, sharing the suffering as well as the work of renewal. 24 year old Oren and his wife moved to Sderot last September to study and invest their knowledge in the developing of a city bound by poverty and trauma yet carrying endless potential. Similarly, 39 year old Ayala and her husband, the parents to eight children, have chosen the same community because of its high standard of education. Although neither couple possesses a prior connection to Sderot, they have each taken on the tremendous responsibility of strengthening the city. Ayala’s husband expresses the importance of settling each part of the land no matter what threat he or she may face. “Everyone has their own enemies”, agrees Rabbi Fendel. Internally or across borders, in every corner of the country and the world, the possibilities of danger are endless. The question is not what one is hiding from but what one is living for. In Sderot one lives for unity against all odds and oppressors. Most unyielding of all are not the buildings or rationales, but the spirit of Sderot residents. “The Palestinians thought they would make this place a ghost town”, witnessed Rabbi Fendel, and they almost succeeded. From 2006 to 2008 he watched businesses closing, the middle-class fleeing, property deserted and trauma brewing. The city was becoming worthless. However, like a seed that grows anew only once it approaches the point of absolute disintegration, Sderot began to sprout, evolving into a capitol of community, study and connection to the land itself. 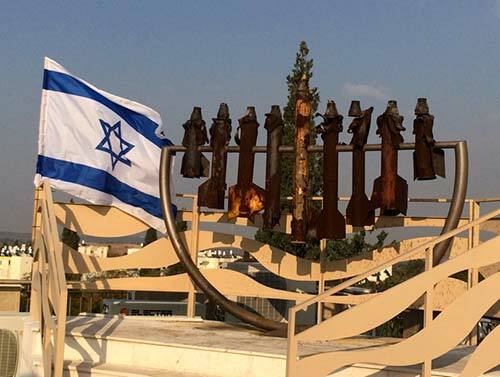 On the roof of Rabbi Fendel’s yeshiva stands a menorah, a candelabra used during the Jewish Festival of Lights, constructed from terrorist rockets. When lit on Hanukah, the menorah represents the eternal radiance of the Jewish spirit. Just as in the times of old after the Greeks failed to extinguish the nation’s spark, the Jews turned their weapons of war upside down and lit them as a symbol of eternity, so too do the residents of Sderot transform these weapons of destruction into a symbol of the sanctity of life and the strength of spirit. The menorah stands tall, proving that while these are just scraps of metal, the people of Sderot are built of materials much more enduring. Menorah crafted from Quassam rockets fired at the city of Sderot. Weapons of destruction turned to symbols of hope. “The entire state of Israel is more resilient than we think and the enemy thinks”, says Rabbi Fendel. “We live through it every day. Sometimes protected and other times unprotected. We have lived in caravans. We have run to bomb shelters; chosen which child to save first over another bound by 15 seconds of an emergency alarm. The vibrations of ‘The Colour Red’, shake through our core and yet we have never abandoned this place. We can proudly say that we won”. Resilience is continuing to live and refusing to leave. Resilience is transforming weapons to sources of light. Resilience is dreaming of a brighter future and the dedication required to make the dream a reality. Resilience flourishes proudly in Sderot; resilience of the body, mind and soul. 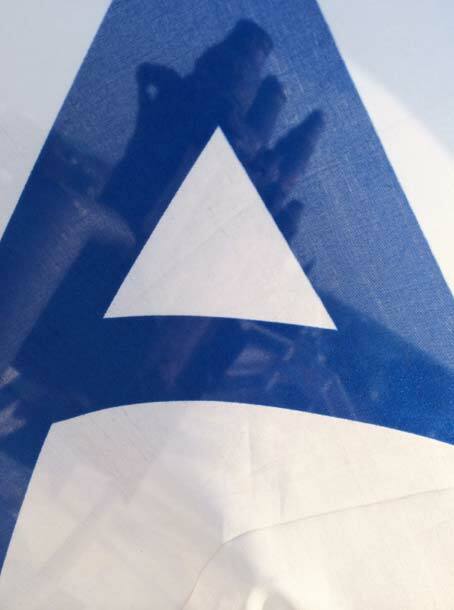 Quassam rocket menorah visible through a point of the Star of David in the Israeli flag. Jordana Lebowitz is a recent high school graduate from Toronto, Canada. She is currently taking a gap year in Israel and interning at the Sderot Media Center as a journalist advocating for justice, peace and ultimately change.